This entry was posted in Software and tagged 232key, A&D, RS-232, USB by Stephan. Bookmark the permalink. How can i get you product regarding weight machine along with a software. I’m sorry, I don’t understand your question. Could you please rephrase it? I am looking for a low-cost scale with serial output (USB or RS232) with which I can continuously log weight; for example, capture weight on the scale once a minute. The output of the scale can be monitored using a connected pc, perhaps using your software. The low cost scale should have a range of 0-25kg or 0-50kg, with a precision of at 1 g or better and accuracy of +/- 2% or better. We will be using the scale to monitor the rate of conversion of dry ice to gaseous CO2, in a protocol for measuring building ventilation rates. This is for educational use at a college in India, where funds are scarce. 232key is not really intended to be a data logging software, it would be better to use an application which directly writes the weight to a file. The software should also have a timer function to periodically trigger the scale to send the weight. We’re currently working on a new software called Simple Data Logger which is going to be available in a few months. Alternatively, you could use A&D’s free WinCT software, perhaps with the brand new SA-30K scale. I recommend contacting A&D India for further information. Will your software do this with a suitable st of scales, a PC, and a printer? 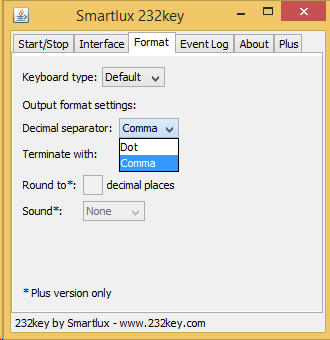 232key is a virtual keyboard wedge software designed to automate applications where the weight is currently being read from the scale by a user and then typed into an application running on a PC. This means that if you generate labels by manually entering the weight, you can use 232key to simplify this process. However, if you’re starting from scratch it might be better to either find a scale with an integrated label printer or a label printing application which can directly communicate with a connected scale (without the need for a virtual keyboard wedge). Will your software record the increase of weight on the scales as a function of time? I am looking to measure how fast a medium drains. 232key is not meant to be a data recording (data logging) software, it just transfers the measurement values from a scale into whatever application currently has focus (cursor position). That said, if your scale has an interval mode to send the weight every x seconds, you might still be able to use it together with 232key for your application. I tried installing it but it says no rs232 comm port found on your system and then it exits. I do have usb port will that not work? If your scale doesn’t have a print button, consult the manual to see if it supports automatic printing (on stability). Otherwise, you can unfortunately not use it with 232key at this time. Hello, thanks for the article. I need to scan ISBNS barcodes from books and weight them too, then input the data on our inventory panel on a pc with windows 10.
do you have a solution for this? and which USB/BLUETOOTH/232 scale do you recommend in my case? can you mention one of each connection type? I would get an USB barcode scanner, connect it directly to the PC and set it up so that it adds a tab after entering the ISBN. Then, get a scale which works with 232key* and configure 232key to send an enter key after the weight. With this configuration, you can create a spreadsheet, scan the ISBN and then weigh the book. The ISBN and weight will show up in the same row. I particularly like the Ohaus Navigator series which can be equipped with an USB interface and supports automatic printing (so you wouldn’t have to press the print key on the scale). Thanks for the information. I’m looking for a simple solution. I have a scale that is USB and my computer only has USB ports. I simply need to put a package on the scale, have my UI read that weight from the scale and transfer that data to my UI. I might have the wrong that scale and all I’m finding as a solution is Download Stamps or Endicia software but they are wanting me to sign up. I wouldn’t think this would be a difficult problem to solve but I’m learning there’s not a plug and play solution out there. I plug in our bar code scanners, and it’s reads it and transmits it with ease. Do you have any suggestions? We have a Precia Molen scale. I want to connect the indicator with a pc that’s why i install a USB to RS-232 converter. But it is not be installed properly. Do you provide me any solution for install the converter properly. The converter is manufactured by FTDI corporation. I am looking for a balance which will transfer the data to the pc and which I can manipulate using visual basic. That means that every time I print the weight of one of my manufacturing parts the weight and other important data would appear in a spreadsheet that I can manipulate. If you’re using your own Visual Basic program, you can communicate directly with the balance over the serial interface (RS-232 or USB virtual COM port) and do not need a software like 232key. The balance doesn’t care which programming language you use, so I recommend looking for the capacity, accuracy and size that you need for your application while making sure that the balance has a well-documented RS-232 or USB (virtual COM port) interface. I can generally recommend balances made by A&D and Ohaus (these two manufacturers also offer free data acquisition software), but there are certainly many other excellent balances on the market. I’m not familiar with MT balances, but it seems that you balance is set to send the weight automatically once it is stable (often called “auto-print” mode). Consult the manual to see if this mode can be changed to interval mode. There might also be a setting to send only stable weights (you’ll want this to be off). Alternatively, use a data logging software which requests the weight from the scale every 30s. If this doesn’t work, you’ll find that many scales made by A&D and Ohaus support sending the weight every 30s. I am looking for an inexpensive system(software and any necessary hardware) that is easily handled to input apw from a database into my counting scales to eliminate the need for sample lots or hand counting. a counting scale which can directly communicate with your database. I recommend contacting a scale dealer or systems integrator in your area. 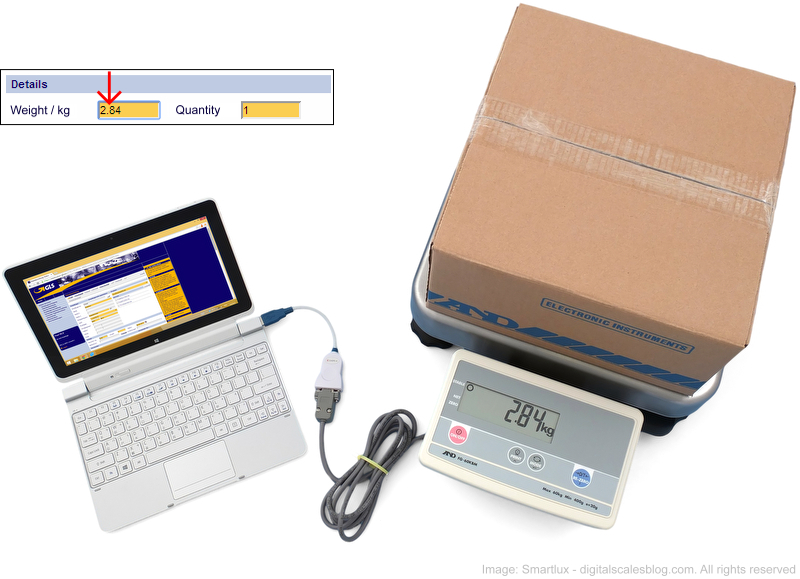 I’m looking for weigh scale traceability software. Our use case is essentially, generating a simple record for each item weighed. The record would include a unique user ID, user name, weight, time stamp and the user ID of the collections agent who authorized the collection and certifies the record. We already have a roster with 40 user IDs matched with 40 user names along with 4 collections agent IDs. Every time a product is weighed, the user would be prompted to enter their 6 digit ID, if the PIN matches a farmer, the record will be displayed for the collections agent to accept. If they accept, then they are prompted to enter their PIN. if the PIN is correct the record is stored and even printed. We now have records which allow us to trace back the weight collected from each of the User IDs and the PIN of the collections agent who authorized it. Is there a way to get 232key to work on a tablet? I’d like to connect a tablet to the scale and read the weights. Your Android device must support USB on-the-go (OTG) aka USB host mode. You’d also need an app which supports the adapter you’re using (you can find some by searching the play store for “FTDI”). 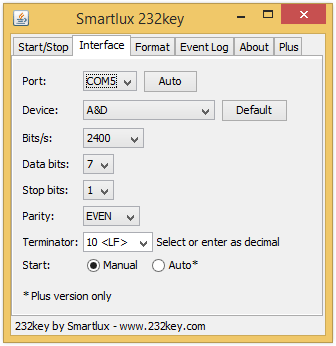 On Windows, you’d need a software which can connect to a COM port (like 232key). You could also use a RS-232 to Bluetooth adapter (serial port profile) for a wireless connection (or a WiFi serial device server). I want to make my digital Tanita Innerscan Scale transmit data to my phone via bluetooth or wifi. I really just dont know where to start. I can give you pictures of what’s inside the weight scale. I can buy a module – whichever you suggest. BUT, i really dont know where to connect the wires to. I also cant seem to find a schematic diagram for this scale. Can you help me out buddy? Please tell me, how should i tackle this. Do you mean this bathroom scale: http://amzn.to/2AQ0tg2 ? The one i have is model BC-541. But yes, that in your amazon link is of the same type. I’ll check on the wires going the LCD. As per your suggestion, I may find my answer there. And I’ll check on that link about load cells too. I’ve downloaded from both the main site and alternate site. I’ve re-downloaded. I’ve downloaded with different browsers and on different machines. Sorry for the late reply. This issue is usually caused by interference from overzealous anti-virus or anti-malware software, please try disabling it during the installation. We have a weight indicator attached to the scale. Weight indicator is Rice Lake IQ Plus 310A. How do we get the weight from the indicator to an input field in our web application. Please see this article for further information: Can I use my scale or balance with 232key? i have a dacell indicator dn 10 w.
Please see: Can your scale or balance be used with our free software 232key? Our lab has virtual bar code generators set up to interface with the scales so we could scan a virtual bar code to capture the mass into our database. We have been forced to replace a balance but we can’t get the virtual barcode scanner to read from the new balance. The virtual barcode scanners are no longer supported and we can’t find a replacement a yet. The new balance has an Ohaus indicator (model T31XW). We could use 232Key, although a bar code scanner is preferred to pressing a key on the indicator to capture the mass. Do you know if a virtual bar code scanner is available and adaptable to our scales indicator? Hi, I’m not familiar with virtual barcode scanners, but if pressing a key combination (on the PC) to capture the mass is something that would work for you, you could use software like TWedge or Kern Balance Connection. 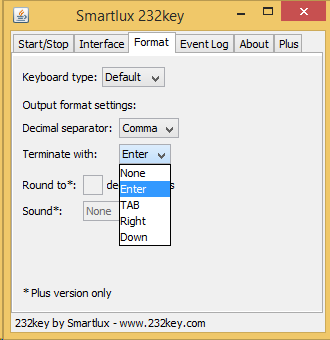 The next major version of 232key will also support this hotkey functionality. I have an SDS – IN520 reader that I want connected to my Zebra GK420d label printer. They are linked with an Rs-232 cable. Can your software provide the needed connection to print labels with the weight on it ? Our software 232key has no printing function, its sole purpose is to type the weight into other applications as simulated keystrokes. So unfortunately it won’t do what you need unless you have a label printing software which allows you to input the weight from the keyboard. I am working on a project where the people in the market weigh the goods and enter it manually, I am trying to automate it through a SaaS via a web browser. There are presently Essae Weighing Sale which is Bluetooth 3.0 compatible and optional RS-232. Can you guide me about various possibilities on who to automate this without manually entering the weights into the browser using Bluetooth/wifi technology (master-browser, slave-weighing machine). If the scales support the Bluetooth serial port protocol (SPP) and send the weight in ASCII format when a “print” key is pressed, it should be possible to use them with our software. You would need one PC per scale running the web browser and 232key. Alternatively, you might want to look at retail scales based on a PC platform.